Video below. This bath oil Has the same orange, mandarin, tangerine, lemon, grapefruit scent as the ‘Sun’ perfume. I took a picture of both for you. I’m so enamored with this bath oil. I have always been a fan of the Sun fragrance. It’s so cheery and joyous and yummy. The Sun bath oil is luxurious, the gorgeous gold shimmer streaming, then dancing, in the water. When the light hits that gold shimmer, i become mesmerized. My favorite of the Lush bath oils. I would stock up on twenty of these if i could. Lush description: Soak up the sunrise. Rays of Brazilian orange and tangerine infuse your bath! Here’s a video i made which shows this ‘Sun” bath melt in the tub. 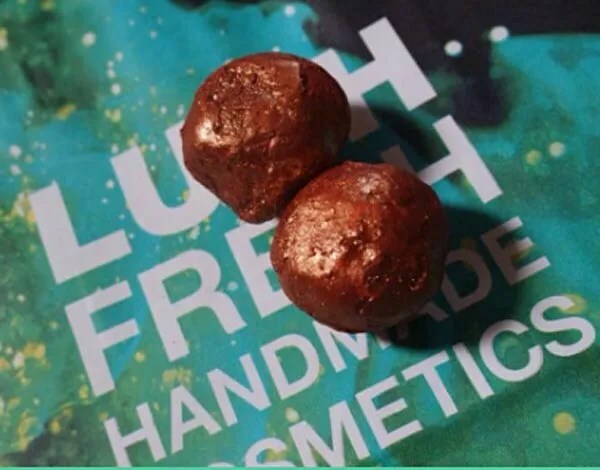 Posted on May 31, 2015 by Lushalot	• This entry was posted in Bath Oils, Lush Oxford Street store exclusives, New. Bookmark the permalink.